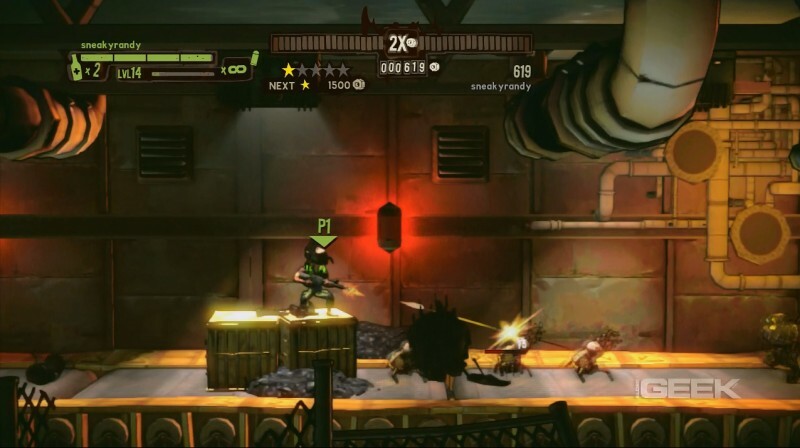 Posts tagged "shoot many robots"
P. Walter Tugnut is out to seek vengeance against a nearly limitless army of masochistic robots in Ubisoft and Demiurge Studios’ latest side-scrolling 2.5D shooter coming to Xbox Live Arcade and the Playstation Network. The premise of Shoot Many Robots is simple. Kill everything that moves, especially if it’s moving toward you with a chainsaw. And its brilliance lies in its simplicity. Anyone who has gamed in the past 30 years can see the obvious influences that Shoot Many Robots reflects–Contra, Metal Slug, Sunset Riders, Borderlands, Left 4 Dead, and maybe add a dash of Castle Crashers too. Those names get you salivating? They should. Need a side scrolling, 4-player co-op shooter? Look no further, my friend. 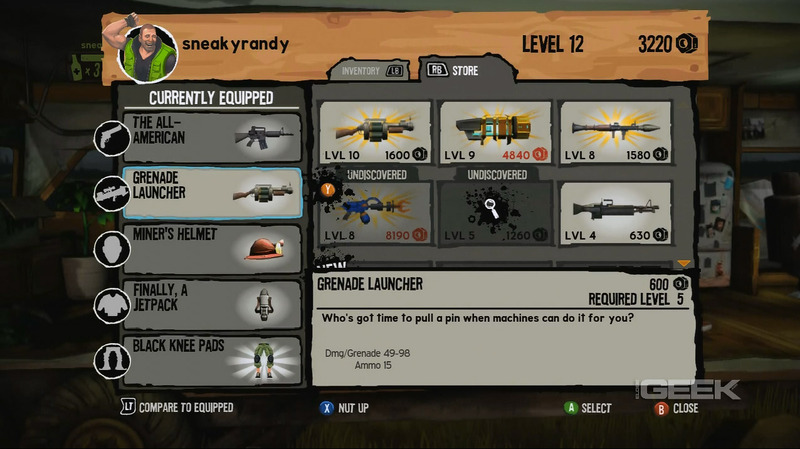 You start your rampage with a simple sub-machinegun and a secondary weapon. Its up to you to reach the end of the level and collect as many nuts as possible. Killing more and more robots grants experience and level ups. Nuts are the game’s all encompassing currency used to purchase new hardware like improved guns, armor, and special effects out of your mobile home’s shower. The weapons and armor range from simple helmets and machine guns to giant freeze rays, guns ripped off of battle ships, tutus, kilts, devil wings, garden gnomes, beer hats, and a P. Walter Tugnut’s former pet that is now armed with a high degree of explosives. The loot is dropped semi-randomly, and based on your level and the amount of nuts you’ve saved, you can amass a rather impressive arsenal. Chaining kills increases the amount of nuts collected, so accuracy, speed, and your ability to dodge incoming attacks all heavily come into play. When the going gets tough and your weapons can’t handle the hordes of enemies on screen, you can also bust out some special moves like your slide attack or slam attack. You will spend hours and days trying to collect all the guns and gear that are available for sale in your shower. Health regenerates in segments similar to the original Resistance. But for tor the most part you’ll lose health faster than you can regenerate it and you need to slam a beer to regain those precious hit points. While there are no shield maneuvers, you can punch red bullets back at your enemies just like Shatterhand. 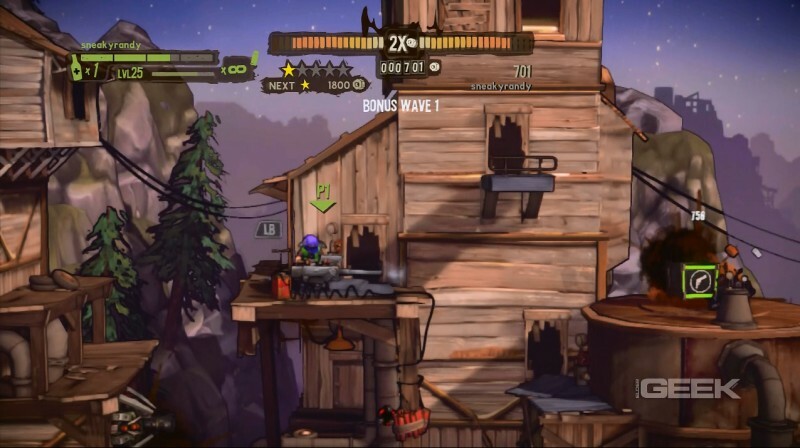 When the single player experience has you ground into a fine powder, you’ll be delighted to know that Shoot Many Robots supports up to 4 players co-op both locally and online. This feature alone will make it worthwhile for gamers who are looking for some great local party games. Graphically, Shoot Many Robots is done in a cel-shaded format. Visually it’s very appealing for a side scroller. Our only true complaint about the visuals is that when playing co-op, all the characters play as Tugnut, albeit in a different colored vest. However, considering everyone in the game will be outfitted in completely different and wacky gear, it’s unlikely this will cause any real issues. Football helmet and a gun ripped from a naval warship? Yeah… I’m ready for war. The only major issue we found with Shoot Many Robots is the fact it might turn into a bit of a grind-fest in order to unlock some of the more desireable gear. Unless you’re sporting some phenomenal robot slaying maneuvers, you may find yourself short on nuts from time to time, especially in the later levels when the quality of your gear is life or death. Lazy, impatient, or gamers with money burning a hole in their pocket can use the “nut up” option and purchase large helpings of nuts for a fairly reasonable price. All in all, we were very satisfied with Shoot Many Robots and plan on spending a lot more time crunching robot guts. If you’re a fan of side-scrollers, or if you’re in need a new party game on XBLA or PSN, look no further.